Last week, in the first post of my new series for beginning canners, I wrote about the basic equipment you need to get started canning. The list included things like a stock pot to serve as your boiling water bath canner and a pair of jar lifting tongs to help you move your jars in and out of the hot water without injury. Today, I’m here to talk about a few pieces of equipment from OXO, that while not absolutely necessary for basic canning, will make your canning prep work infinitely easier. This post is sponsored by OXO and features a giveaway at the end. When I was a senior in college, I lived with two friends in an off-campus house. When we first moved in, we spent an evening unpacking our kitchen boxes together, choosing from the duplicates and making a list of the things we needed to fill any gaps in our tools. At that point of my life, I thought I was fairly well-versed in all available kitchen utensils, but when Andrea pulled out a pair of squat, metal pincers, I had to ask her to identify the tool. She told me it was a strawberry huller. Later, when strawberries came into season, I tried her huller, found that it was was far more trouble than a paring knife and wrote off strawberry hullers forever. Or so I thought. A few years back, I found myself in possession of a OXO Strawberry Huller (I think it was included in a gift bag I picked up at a conference). Remembering my previous experience with hullers, I was ready to dismiss it. However, it happened to arrive right around the same time as a flat of strawberries and so I tried it. Immediately, I was won by its charms. It has the ability to remove the leaves and hard hull of the berry without pulling away any valuable flesh. It wastes so much less than my old paring knife technique and does it in less time, too. I am now among the huller converted. The first year I canned cherry preserves, I was foolish. I pitted an entire flat of sweet cherries with an unbent paper clip. I learned the technique from a video on Gourmet’s website (oh, how I still miss Gourmet!) and thought that if it was good enough for them, it would be good enough for me. What I didn’t realize was that there’s a big difference between pitting a few cherries for a tart and pitting 8 quarts for multiple batches of jam. By the time I was done, it was 1 am and I’d spent four hours removing pits from cherries. Though I was dizzy with exhaustion, before I went to bed I logged on to Amazon and bought myself an OXO Cherry Pitter . I’ve used it ever since and it has made my stints as a cherry processor far more pleasant. Growing up, we had just one colander in the house. My mom liked it best that way, because it meant there was less to store and manage. However, almost every time I needed to drain or rinse something, I’d reach for the colander to discover that it was already in use. This led to many frustrating moments and overcooked pots of pasta. I swore that when I had my own kitchen, I’d have a few colanders around, to ensure there was always one available when needed. I may have taken that promise a bit too far, because if one were to count the number of colanders, perforated berry bowls, and fine mesh sieves currently in my kitchen, they’d discover nearly a dozen different options. I don’t see them as clutter though, because in the course of a week, I’ll use nearly every one. I guess I do a lot of rinsing and draining. Lately, as berry season has gone full-bore in the Philadelphia region, I’ve found myself turning to OXO Berry Bowl and Colander set more and more often. You can give your berries a good rinsing, pop the colander into the bowl and put it right onto the table, without dripping or an extra plate set underneath to catch extra water. The bowl also has a lid, which makes for easy leftover storage. Last, we come to the OXO Food Mill . This is the food mill of my dreams. When I first moved to Philadelphia, I inherited a large box of vintage kitchen equipment. It had all belonged to my Great-Aunt Doris and had been living in my cousin Angie’s garage for the last 15 years. Included in the box was a dented oval roasting pan, a rusty french fry cutter, and ancient Foley food mill. The roasting pan was quickly demoted to storage vessel, the fry cutter is still caked with rust, but the food mill went straight to the kitchen. I used it for years, despite the fact that it was impossible to clean (it was a one-piece model without a detachable screen), had a tendency to discolor acidic foods, and was slighted dented (which made it hard to turn the handle smoothly). Two years ago, I bought a new food mill from one of those discount shopping websites, thinking I was doing myself a great service. The first time I used it, the little legs that keep it elevated over the bowl all snapped off. I was ready to swear off food mills entirely, when I used the OXO version while teaching a cooking class. The screens popped in and out without pinching my fingers and were easy to clean. The supportive legs were sturdy and could take the pressure necessary to mill the tomatoes I was deskinning and seeding. And the handle turned smoothly and easily. It was my dream food mill and I use it all year long to make fruit butters, sauces, soups, and tomato products. I will never use another. Leave a comment on this post and share your favorite OXO tool. If you don’t have one, take a look at their website and name one you wish you had. Comments will close at 11:59 pm east coast time on Friday, July 12, 2013. Winners will be chosen at random (using random.org) and will be posted to the blog on Sunday, July 13, 2013. Disclosure: OXO provided me with the tools pictured in this post for photography and review purposes. They’re also providing another set of the same implements for this giveaway. They did not pay for placement and all opinions expressed are my own. Additionally, there are a few affiliate links in this post. I love my OXO cherry pitter! Beautiful design, and wow, does it ever work well! Having 2 in the house when we pit large batches of cherries would be even better. I have never heard of or used any OXO product. If I had my choice though, I think I would love to try the Food Mill. I just started canning last year so these items would be amazing! Currently my favorite OXO tool is their Smooth Edge Can Opener! It is so easy to use and you never have to worry about a scary jagged edge. I am very fond of the OXO pastry brush that we have. So useful! I wish I had the food mill, it would really come in handy all year long. I have an OXO lemon zester that I love. There are times when the microplane is just fine and this one works great. OXO has a huge pancake flipper that I love, but don’t have. It’s sort of a luxury item when one has a regular spatula, so I’ve never indulged myself. Maybe someday…. I use our OXO salad spinner nearly every day! I love my Oxo peelers, locking tongs, salad spinner…. I could go on and on. I wish I had a mandoline slicer! I love my OXO tongs. They work so well and lock in a closed position so they don’t take up so much space. I love my salad spinner but my kitchen is filled with OXO things. I have long wanted a food mill though. I am really anxious to try their Food Mill. Looks flexible and sturdy!! I love my OXO 9″ tongs. From picking jar lids out of hot water to flipped chicken on the grill, they get the job done without pinching my fingers. I would love to have an Oxo food mill! In our house we go through the PB&J sandwiches like crazy so I spend most my summer making jams of every flavor I can think of! I use my OXO bottle brush nearly every day. It’s super sturdy and great for cleaning water bottles and narrow-necked jars. I love, love, love my Oxo peeler. It peels things so nicely and smoothly and the larger sized handle gives my hands a break from gripping too hard while working in the kitchen. I wish I had their mandoline – it looks safer than a lot of them. And I am coveting that food mill! I love OXO products – I have arthritis, and the handles help me grip their tools better than anything else I’ve tried. The salad spinner is also very easy to use and clean. Great company! I agree with Molly, that pastry brush is always being used at my house. I especially like how easy to clean it is. I’m in need of a new tea kettle. I’ve been eyeing OXO’s Uplift tea kettle, Anniversary edition: http://www.oxo.com/p-956-uplift-tea-kettle-anniversary-edition.aspx It’s beautiful! I have many Oxo products, but the most used and useful in our household is the salad spinner. Close second is the wine stopper/pourers which are terrific. Haven’t met an Oxo product yet that isn’t welcome in our house. I would love the cherry/olive pitter! My OXO salad spinner is probably my favorite kitchen gadget. It cleans and stores heaps of lettuce beautifully…a very handy thing to have during early CSA season. I am in desperate need of a mandoline. And any of the OXO look like they’d be great. But this berry pack is much more exciting! Just started canning last year and would definitely put all these items on my wish list, especially since we just started growing berries this year! My fave is their mandolin! I use it all the time when making kraut. I love my OXO salad spinner! I’m glad to know they make a solid food mill- will need one! My favorite would have to be the food mill although many other things come close. My favorite OXO tool is the very thin bladed spatula! I couldn’t imagine struggling anymore with fat bladed spatulas to flip pancakes or anything! It just gets right under the food, no problem. I would love the food mill…I have an ancient one, that works, but an upgrade in time for canning would be ideal! Thanks. It’s definitely my vegetable peeler – sharp, has a good grip, and keeps my hand from cramping up. The Locktop containers are great for packing a lunch. I love OXO products! My favorites right now are our POP containers – fantastic for general, air-tight pantry storage. I’ve been lusting after that cherry pitter though…and a food mill with legs! Far superior to my current one. The OXO potato peeler is the best! It does a fantastic job peeling and also has a digger thing on the end to get out the eyes. I would love to win these OXO items. I love the oxo products in general. I would love one of their food mills! With my raspberries starting to come on strong, I think the food mill would be just perfect in my kitchen! I have and really love their smooth edge can opener . No more cutting myself when trying to wash cans for recycling! I love my OXO scale and use it every day — usually multiple times. I have just started canning and have never heard of Oxo products. I do not own a food mill and would love to try it as well as other Oxo products. Anything to make my life simpler and canning more fun is always appreciated. I LOVE the soft edge can opener- as a mom with young kids, I appreciate the edges not being razor sharp, and it is quick and easy to use! I would love these canning supplies! I really like my Oxo apple cutter as well as their paring knife. I love OXO products! I received a bunch of different utensils and a nesting bowl set as a wedding present 8 years ago, and everything still works like brand new! Love my food scale, mandolin, measuring cups, etc. The food mill with removable screens sounds amazing! There are so many favorites it is hard to choose! The whisk or the silicone basting brush or the tongs??? Can’t decide. I buy Oxo items when possible. My favorite would have to be my cookie scoop. Evenly sized cookies every time! It’s crazy but my favorite OXO product is a vegetable peeler. It’s sharp and makes great peels! I would love to have a cherry pitter – I usually use the straw and bottle method which isn’t the best. It’s hard to choose, but I think my favorite has to be my Oxo tongs. When I bought them, they were the only alternative I had found to the scissor-handle style I had grown up with, and they were truly revolutionary to me. I still marvel at how perfect they are. Oh this time of year the cherry pitter is the most amazing OXO tool ever! Oh, sigh… the food mill for sure. I have priced them and its just a luxury item I cant afford right now. But oh the things I could do with it! My favorite OXO product? That’s a tough one, Marisa! If I really had to pick one, I would say the 1.5″ pastry brush. I went through so many pastry brushes – they get yucky after awhile – and I was tired of picking brush parts out of glazes and off. The OXO pastry brush coats well and leaves nothing behind. And it cleans up so nicely! Second and third place goes to the silicone coated wisk and their Lock-top boxes which I use to haul cupcakes to work and store leftovers. The foodmill looks fantastic! At this moment, the smooth edge can opener and the salad spinner are my faves. Would LOVE to get all these lovely goodies. Last year was my first year canning and I am already planning this year’s what-to-put-up projects. Ooooh my favorite OXO tool is the can opener that leaves the smooth edges. I really want a food mill!!! I love my cheese grater. This giveaway looks awesome! I have lots of OXO tools. They are sturdy and comfortable to use. At the top of the list of favorites? Probably the can opener. Smooth to use, and cleverly leaves no sharp edges for cuts. I currently am not an OXO product owner. However, my daughter is. The OXO canister set with its push-button-and-pop-open lids she has are so easy to use. I think the canister set is fantastic and would love to have a set of my own for storing the sugar needed to make jams and jellies. Living amongst the orchards in the Cherry Capitol (near Traverse City, MI) I LOVE my OXO Cherry/Olive pitter! My two year old prefers it to be used on olives… her favorite food! My favorite OXO item is my salad spinner! It has a stainless bowl with a rubber bottom that keeps it from sliding all around the countertops. It’s really easy to disassemble to clean, too. I’ve had it for years, but you’d never be able to tell – it works as sood as it did on Day 1! I am on the hunt for a really good food mill (within my price range), this one sounds excellent, if I don’t win I might just have to save up for it. I love the garlic press I have from OXO. We’ve used it for years. Love it! I have an Oxo can opener and love it! I went to the website and now want one of everything too! My favorite OXO tools have to be the OXO Good Grips POP containers. I have an entire set, plus extras and use them to store just about everything in my kitchen. I really like that they come in different sizes to accommodate different needs, but regardless of size, they all stack together perfectly. Great space savers! Yes, please! I’m still using my mother-in-law’s old vintage cone mill and wooden pestle. I really need a new food mill. I only own one Oxo tool, a can opener, and I really do like it. My favorite OXO product is definitely the silicone pastry brush. The center bristles have holes in them that trap liquid which makes brushing on butter or egg wash so much faster and easier! And the fact that the whole brush is silicone and can go from a hot oven to the dishwasher and back while still looking perfect is an incredible innovation! My OXO whisk is likely my favorite. I love to whip things by hand, and the handle is just so perfectly fitted! That food mill also looks pretty good, though! I have an OXO spatula set that is still working quite nicely all of these years later. I have their carrot peeler – love it! thanks!! 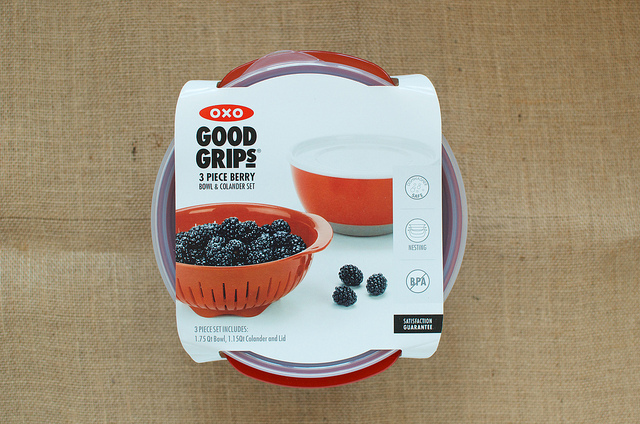 I don’t have any Oxo products, but I love the idea of the berry bowl and colander set! I love my OXO food mill! I would not attempt summer canning season again without one. My favorite OXO is stll their big grip, manual can opener. It is great! I got the OXO food scale for Christmas a couple of years back and I LOVE it. I use it way more than I ever thought I would. So easy to use. All of these products look great! I do need a cherry pitter. I’ve been using the paper-clip method and it’s getting old. I love my oxo can opener. It would have to be my can opener. I love their meat tenderizer. Nice weight to it which helps to pound out meat and chicken to just the right thickness. Cherry pitter, hands down! But that’s only because I don’t have the food mill, which is what I’m really eyeing in this prize pack. I love my 2 cup angled OXO measuring cup. Love how easy it is to measure liquids with it! The lemon zester is wonderful when I’m making marmalade or twists for cocktails. I’m on my third because I keep lending them to people. My fav is the ice cream scoop, but I would love the cherry pitter and many other tools. I *love* their vegetable peelers. I have both regular and serrated. I buy them as an extra little housewarming gift for friends. I love my OXO V-blade mandolin slicer! I use it to make zucchini noodles! Yum. Without a doubt, their vegetable peeler is the best one I have ever used. Love it! And, you can buy replacement blades for it so when it gets dull you don’t have to throw the whole thing away! I love love love my Oxo Vegetable peeler. It gets used constantly in my house! Thanks for this giveaway! I follow your blog because of Susie Gibbs and Juniper Moon Farm! I love my oxo vegetable peeler, BUT now that I know they have a website, will most likely order the garlic peeler, because we have a huge garlic garden and I could really use it! I am am avid home canner and could certainly put the giveaway tools to good use! I think the OXO cherry pitter could easily become my favorite tool. Cherry Pie! Without a doubt, it is my food scale. I use it all the time! That’s really hard to say, as I have LOTS of oxo tools in my kitchen. However, definitely one of the most-used is that strawberry huller, so much so that another one would be warmly welcomed. In So-Cal, strawberry season runs mid-January through the summer, and it’s so much nicer to just be able to pop a berry in your mouth and not worry about the icky leaves. It’s not a party around here without a big bowl of strawberries from the strawberry lady (they sell out of a truck around the corner, hooray!). I’ve gifted that strawberry huller, and the cherry pitter, to several girlfriends who coveted mine. My favorite OXO tool is the classic – the vegetable peeler. It’s comfortable, works better than most others, and is the only piece of OXO equipment I always replace as soon as I have to, both at home and in my professional knife kit. I love and use both my vegetable peeler and pizza cutter a good deal. Thanks for offering such a great package!! Cherry Pitter. How can one live without? We have the cherry pitter and it is so much fun to use. And it doesn’t hurt that it makes it very easy to sneak a cherry or two while doing the job. I love my OXO whisk and pop containers. The OXO products are really great! What a great giveaway! I agree, while you don’t NEED these items, they really make the job of larger scale food prep so much easier. I really, really want their steel chef’s mandolin. I used my mom’s over the weekend while we made sofrito and I fell in love with how stable, sturdy, and efficient it is. I do not have any of these products yet. However, that food mill looks awesome. I can all kinds of tomatoes and was thinking about trying to can my own tomato sauce, bbq sauce, and ketchup but removing the seeds with any of my equipment is a nightmare right now. My best friend’s mom sent me an OXO cherry pitter last year, right after I had finished pitting our harvest by hand, and I was so happy to have it this year when our cherry tree produced three-times as many cherries! Dreams do come true!! My favorite OXO is the little 3oz measuring beaker. Great for lemon juice for canning as well as measuring ingredients for cocktails. And my food scale. My favorite Oxo possession is the ice cream scoop, which come to think of it doesn’t make me sound like much of a cook. But it really is a great design! I’ve also been eying up their cookie scoops for a long time. I love my OXO can opener. Works like a dream. I would love the food mill. That looks fantastic. I love all my OXO products, but my favorite is the vegetable peeler. It works. And it’s really comfortable in my hand. I have three OXO ceramic spice mills that I use for the few spices I need freshly ground on a regular basis. I love them, though I don’t see them available any longer. A new food mill would be so welcome. I have the rusty, ancient Foley, too. And no cherry pitter in our house, though several pounds of cherries due from the orchard this week! Hands down it’s that food mill…. I wish I had one every year during canning season!! What I really love are the mini measuring beakers – perfect to set out even the smallest liquid measures, easy to clean, and compact to store. I too love everything OXO I own, although I would love to win these because I haven’t tried any of them. I think I’ll go pretty boring and say I love my OXO vegetable peeler. It’s got that grippy rubber handle that means it won’t slip out of your hands even if they’re a bit damp. It’s a tie between my can opener (so comfy) and the vegetable peeler. I have been eyeing OXOs food mill and cherry pitter for weeks and haven’t mustered up the courage to actually order one. I love the look of that strawberry huller too, I don’t like the pincer kind either, it’s nice to know there is an alternative! I hope I win! I like all of those tools! I don’t own any oxo products, but would love the food mill! Thank you and OXO for offering this giveaway. Isn’t it funny sometimes when you think you don’t need a special tool to do a job, but when you use it you wonder how you ever managed without it? My most recent and most useful OXO product is the Salad Spinner that I splurged on. It has cut down on the effort spent at the kitchen sink rinsing lettuce and other green harvests from the garden this spring. The spinner also dries the leaves much better cutting down on the time the greens sit on the counter waiting for the excess moisture to dry before storing in the fridge. I love my Oxo can opener – it’s lasted longer than any other can opener I’ve ever had! I have a few OXO pieces of equipment in my home kitchen, but the one that I use the most is the one OXO item that I’ve been using for years that lives in my knife kit at work. I’m a professional chef, and most of that kit is filled with expensive knives, but there is a OXO vegetable peeler that has lived there for years. It’s cheap, comfortable, sharp, and doesn’t break like a lot of other ones I’ve seen around the various restaurants I’ve worked in over the years. I run it over my diamond steel every once in a while to keep it honed, and it still peels carrots and other vegetables quickly and easily five years after the last time I replaced the old one with a new one. Fav OXO tool has to be my can opener… user it often and love it!! Awesome giveaway BTW! I would love to own the food mill. I remember my grandmother had this tool, and I would use it for numerous canning and cooking projects. My OXO Mandoline Slicer and my can opener and my vegetable peeler…this is a very nice giveaway! I have so many oxo products Its hard to pick my favorite, The veggie pealer that works so much better than every other one I’ve had. Or the measuring cup with top readability, are a few. I also spent a very long night pitting cherries for canning one night last year and would love this & the strawberry huller to help with canning this year!! I would like to make all of these my new favorite OXO tools! But I have loved all of their baby/toddler feeding gear too. I would love that food mill! That’s one of the two kitchen items I’ve been dreaming about lately. I love my OXO pizza cutter. We’ve had it for almost 10 years and it is still going strong. I must say a food mill is on my wish list so I would be so happy to win these tools. Thanks for the chance! I have a few different products and love them all from my measuring spoons, colander & nesting bowls to my favorite the Pancake “batter dispenser”. But what I really need is a food mill!!! My favorite is my silicone pastry brush. It’s awesome. I have an OXO can opener and a corkscrew that I’ve had for about 8 years now and I love them both! I have an old Foley food mill that I still use! It’s so bad, I’d love a new OXO one!! My favorite OXO tool is a knife I picked up years ago at World Market – it’s my go-to knife in the kitchen, I love it! I also have a great vegetable peeler from OXO. I know it sounds silly, but the measuring cup is my far the most used — they are so much more durable than the little pretty ceramic ones I USED to buy before I had children! This sucker has lasted me YEARS and it’s still going strong! I have lots of OXO tools. I would love to add these to my lineup! I share a cherry-pitting-nightmare learning experience with you Marisa. This year, I bought the OXO cherry-pitter from the grocery near my house, and batch #2 of frozen cherries was SO much better. Also, their food mill is on my to-buy list. I use my OXO food scale almost every day! oooh, I am just starting to get into canning, would love to add these tools to my arsenal. Looking at their website, I would love the cupcake corer What a handy little tool! I love cake decorating, and I am already thinking of the fun creations I could make with that tool. My favorite OXO tool is the one I am using at the moment. I love them all, naming one would be like saying you loved one kid more than the rest! The manual CAN OPENER is probably the most used and most appreciated, for its ease of service and its green efficiency. The small WISK is also an awesome tool – I am big to whip things up and that wisk gets the job done. Now I must mention the cookie dough scoops also – they have given my cookies uniformity – and who doesn’t love a cookie in a uniform? Thanks, OXO, your products are great. I’d LOVE the food mill. I have 18 tomato plants this year and I know a food mill would help speed up my cannning production. I’m in love with my whisk, and have had my eye on the food mill for years! Wow, I’d love to have the OXO Food Mill. I have an old Foley Food Mill that has to be close to 45 years old. I love the look of the handles on this new model; I have arthritis in my hands and that makes it difficult to me to use a lot of things. This looks like it would be far more comfortable to use. Thanks for the opportunity to win. My favorite tool of theirs is without doubt the vegetable peeler. I do like their silicone tipped tongs as well. Ah, oxo, how I love thee! I’m in desperate need of a good food mill. I have raspberries and blackberries in my garden and I really hate straining them to get the seeds out to make jam. I would also love to have a cherry pitter since I planted a cherry tree and expect to have it producing next year. Thanks. Woohoo a giveaway 🙂 I love OXO’s serrated veggie peeler. The thing is awesome – it peels raw tomato skins! I would say vegetable peeler, because it really is the best on out there. My kids would say salad spinner, because they love making it spin really fast. I love my OXO peeler (not sure this is the professional name of the tool). No other peeler works as well! I like their Batter Bowl. I love my OXO tongs, I use them for everything– from stirring pasta to helping with canning! I never have seen their food mill, that is now on my wish list. My boyfriend recently purchased an OXO mandoline and it is fantastic. I had never had a mandoline before, but now I couldn’t imagine not having one. It’s so handy! I have the OXO y-shaped vegetable peeler and love it, and have been thinking of getting the julienne peeler as well! These products also look great! I would definitely love to try that food mill! I could not live without my OXO salad spinner. I love my Oxo seal-top coffee mug – when I was commuting to work by bike in Philly, I could just throw it into my messenger bag and go without having to worry about it. I love all of their products, but a food mill would sure come in handy! We have many OXO products, but my current favorite is the cocktail strainer. Manhattans for the win! I use my OXO vegetable peeler all the time and can’t imagine going back to one of the old fashioned ones. I must be getting old to find their comfort handles so indispensable! I have wanted this particular OXO food mill since I first started canning! I really want it! My OXO Melon Baller. I use that way more than I ever thought I would before it was gifted to me. I’m going to buy the food mill if I don’t win, I have an old, hand-me-down Foley that has seen better days. definitely their can opener!! so awesome!! I LOVE the OXO foodmill! What a dream it would be to have that while canning! I have the Oxo food mill and I love it. Oxo has so many great kitchen tools but if I had to choose some others, I think it would be the 3 piece peeler set, the garlic press and the mandolin. I only have the cherry pitter (of the above) but since my kids can’t even eat cherries at all until I remove the pits it was an absolutely essential purchase otherwise we couldn’t eat cherries! I also LOVE their vegetable peeler, nice bulky handle grip. I just read a review of the OXO cherry pitter on one of my favorite food preserving blogs, they love it. My favorite OXO tool is the mango slicer, so much less messy than doing it all by hand. Love their potato ricer. You can even extrude homemade rice noodles with it! I love the OXO measuring cups. We got a set as an engagement gift, and I use them all the time. My favorite OXO tools are my silicone spatulas. I have 2 sizes and I use them almost every day. I would love to own that OXO food mill! I love their tongs – use them almost every time I cook, and I definitely need a couple more! My favorite OXO tools are my vegetable peeler, which is sharp enough to never have to retrace your swipes and my microplane for zesting lemons. I love their tongs because they lock closed so easily. What an awesome giveaway! I have a bunch of oxo stuff but I particularly love the measuring cup that you can read from the top. Oxo’s Steel Chef’s Mandoline is my favorite Oxo tool. All of their products are fantastic, but I would love to add that food mill to my canning supplies. I have to say, I love my OXO jar opener! my cheese slicer! always holds up and never slacks! We’ve got a pretty good Oxo ice cream scoop that’s better than one’s we’ve had before. Their salad spinners are the best! I have the little one, which is perfect for herbs or smaller salads. That berry bowl looks fantastic! I just bought an Oxo set of kitchen tools at Target when it was on sale recently for $30, it was quite a steal at that price considering some of the items cost around $10 a piece when bought separately. So far I love the whisk, the rubberized grip helps immensely when you need to really whisk something. I LOVE my cheese grater. It’s super sharp and beats using a dumb box grater any day. Thank you for the chance to win such a lovely prize! I love my peeler. The cherry pitter looks great! Cherry Pie is my summertime favorite. Their vegetable peeler is the most used tool in my kitchen. I love my vegetable peeler-something so simple but it really is the best one I’ve ever used! I covet a cherry pitter. I really like their mixing bowls with the oversized handles and non-skid bottoms. Love my vegetable peeler, would absolutely love the food mill! My OXO kitchen shears are hands down one of my favorite kitchen tools. From snipping herbs to breaking down a chicken, they do it all. I have two favorite OXO products, my salad spinner and my can opener. I have had both for about 15 years and they work just as well as they did when first purchased! Recently purchased the digital scale from OXO for baking and love that too. I am new to canning and would love to have these tools. Thanks for the giveaway! I could really make use out of the berry bowl! I love the cherry pitter! I don’t have one, but need one. I have a 2 year old that loves cherries, but cutting around the pit is such a pain. My absolute favorite OXO tool is the one that has lasted me the longest (10+ years!!!) – my handy-dandy peeler. My favorite OXO kitchen tool has to be my can opener, followed closely by my vegetable peeler! I’m not too fond of most of Oxo’s utensils because I find their handles too bulky for my hands. However, we’ve got three of their plastic cutting boards, which are awesome. I’ve systematically upgraded most of my kitchen utensils to be OXO. They’re so much easier to use and often easier to clean. It’s hard to pick one, but if I had to, I’d say their stainless whisk w/the silicone top. The design makes it much easier to whisk for longer periods of time. 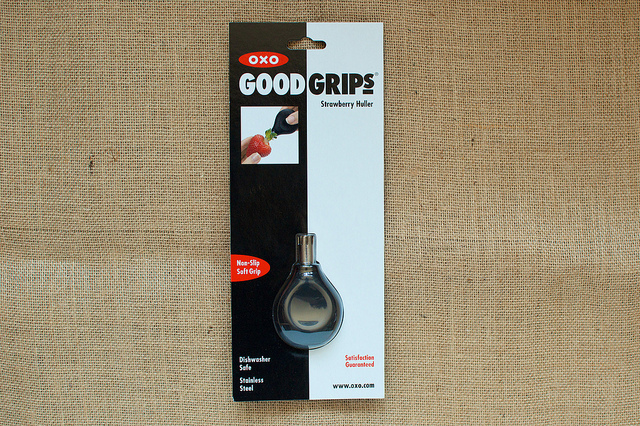 I think the Good Grips berry pack will be a great addition to my kitchen. I use good Grips products already; potato peeler, pizza cutter, and potato masher. They are easy to use and last a long time. The berry pack will be the perfect addition to my canning tools – and my family loves berries, any kind of berry is good at our house. I love to cook with berries, eat them in my morning yogurt, and make sauces for ice cream toppings and pound cake. The berry pack will be used a lot!!! I want the berry bowl. My toddler loves berries! I love my OXO 1, 2 & 4 cup angled measuring cups. I would love love love the food mill. I love all my OXO utensils but if I have to pick I guess it would be the vegetable peeler…makes peeling so much easier. I would cry if I couldn’t have my OXO nylon-head tongs anymore — they are hardly ever clean at our house. I just spent two hours bonding with my OXO strawberry huller yesterday and thinking “I need a second one so I can put my husband to work, and also this should be the year I try cherry jam.” Hand to God. So, I definitely will use this kit!! The food mill would be an awsome addition to my kitchen. I love this site and your book. It made the canning adventure so much fun. I have tried several recipes without too much worry because they are small batches. I am from central CO, and love the jam recipe that uses cantaloupe. We have fresh Rocky Ford melons every week at the farmers market while they are in season. Who would have thought that cantaloupe would make yummy creamsicle flavored jam. I love my OXO measuring cups and my vegetable peeler. The food mill would be a great addition. I’d love the food mill. I love my OXO wisk and measuring cups. Thank you for this wonderful giveaway. Good luck to all who enter. My favorite is the OXO mandoline. I pull it out every time I make pickle chips. I have the oxo measuring cups and love them. I love my OXO measuring cups and vegetable peeler. The food mill would be a great addition. We love to use to oxo cocktail supplies- like the muddler and the double sided jigger! I love oxo’s Stainless Steel Multi-Purpose Scraper & Chopper. I use it so much that I have two of them. I think I would love the cherry pitter. I have their garlic press and it is okay, but I like the OXO bench scraper I have better! The cupcake corer looks like an interesting tool to make filled cupcakes a little easier! Those turntables look interesting…I have a lot of OXO stuff, mostly things like can openers. And a can opener had better be a good one or your quality of life will suffer. My favorite OXO tool is the medium scoop. It is like a tiny ice cream scoop and it makes perfectly sized cookies! I love most everything from OXO – favorite that I own is a scrub brush that doesn’t make my arthritic thumbs hurt. My OXO ladle is my favorite – it’s my go-to tool for filling canning jars. Thanks for opportunity! I would love the food mill. That food mill looks amazing. Every time my sister and I jam together, we complain about our food mill (like yesterday when we made 5 pints of gooseberry jam). We use my old one that I got for cheap at Target. The food mill part works fine but the feet are the problem. They’re perfectly well attached, but they’re too small for all three feet to fit onto any pot that has ever been mass produced on the planet. Which means one hand must always be kept on the handle (rather a problem when trying to get that last bit of unmilled food into the mill). A food mill with a properly sized base would be great. I could do so many things with that mandolin! OXO stocks my kitchen! 🙂 I love their POP containers. Their veggie peeler works best! I have several OXO products that I love, but I think my favorites might be the POP canisters that hold my flours and sugar. I’ve been using them for over 4 years and they still look and work great! Definitely my salad spinner! I’ve had it for 5+ years and it’s still going strong. I am amazed that I don’t have any OXO products. I’ know I’ve bought a lot for wedding gifts. I am gearing up for canning season, and just picked 26# of blueberries. I would love to have the food mill–thinking about blueberry syrup…yum. Favorite tools – PLURAL, are the digital timer, instant read thermometer, my wonderfl 22lb food scale, fat separator, and 3 piece peeler set. I think I have more pieces and would definitely love the canning/berry set! Love OXO products! I have several OXO products but my favorite (at the moment) are the measuring cups, ESPECIALLY the 2 oz. measuring cup. Love it! I love the flat peeler for potatoes and carrots and various other veggies. Also the salad spinner! I have a ton of blackberries here but need a food mill to grind out the seeds to make yummy jams for gifting. Favorite? Probably “the” ladle that is always used to fill jars. Just the right size and shape. And weight. And length of handle. I would love to try out that food mill! I’d like to have the julienne peeler in my drawer! It may sound silly, but I absolutely love my OXO ice cream scoop. It has excellent balance and a pleasing weight, and its general sturdiness makes scooping just about anything effortless. Oh, OXO…how many ways do I love thee? Salad spinner gets the most use. Cherry pitter is the best design. The citrus zester…that’s the favorite, though! I did the same thing with the cherries and the paper clip! I actually ended up using a chopstick. Still haven’t broken down and bought the cherry pitter, but I definitely want one! I’ve never seen the berry colander before; it looks really cool! It sounds silly, but I have a little refillable dish scrubber that I love. My favorite part is it comes with its own dish to rest in, so I don’t have to worry about getting soap/water/suds all over the counter. I absolutely LOVE the cherry pitter – I had one that we used religiously for the longest time, ended up giving it to my FIL and MIL who have a cherry tree in her yard. She would make my husband and his dad pull the cherries ‘just right’ off the tree to leave the pits. They hated it, but loved the pitter! I could really use the Chef’s Mandoline Slicer for all the squash and cucumbers I’m getting out of our garden now! I have their can opener and would love to have these too!!! Thanks so much for the opportunities! My favorite OXO tools are the garlic crusher (with the clever built in gadget to get the garlic bits out of the screen) and my several pairs of kitchen tongs including the ones with the silicon tips for non stick pans. I have more but there are the ones that get used almost daily. I love my salad spinner, soooooo much easier than trying to find enough towels to lay out several bunches of greens to air dry! I would absolutely love the locktop lunch set!!! Thanks for the opportunity!! I like their potato peeler. It has a nice wide handle that fits into your hand and the head doesn’t spin around like the old ones used to. My cherry pitter! So handy when putting up cherry/almond jam. That food mill would be heavenly, though. The two piece bowl scraper looks awesome and I hope I win the contest! Love my oxo vege peeler, apple corer and oyster shucker! Really easy to use tools. I have always loved the Oxo’s design aesthetic! THe mandolin, food mill, and the scale are on my wishlist! I have the OXO Julienne peeler. The greatest invention every! Works especially well when you are overrun with summer zuchinne — makes long “noodles” of zucchini to use as pasta or in pasta dished. Also works great on carrots! This is my dream giveaway. After hulling 14 POUNDS of strawberries the other day, I think I have carpal tunnel. But my real dream would be the OXO Food Mill. Applesauce season is around the corner! The food mill is on my wish list! Thanks for the giveaway! My favorite is the OXO mandoline slicer. It’s the best! What a cool giveaway!! I happen to be in love with my OXO cookie scoop. I love their vege peeler, but I could sure use that mandoline. I love my OXO food masher (potato masher, but I’ve never actually mashed potatoes with it!) for crushing fruit for jam! Just in the last month I’ve used it for blueberries and strawberries! The blue locktop lunch set looks exactly like what I’ve been looking for, although if it was made of glass it would be perfect. Thanks! Wish I had the food mill! I have one of the vintage hand-me-downs mentioned in the post. While it’s not dented and works sort of ok, there’s only one screen, you can’t change them out. And it’s all one piece so really hard to clean. I’m drooling over the pics posted here! i love the muddler- for mojitos, mashed potatoes, guacamole, smushing berries, and everything in between. i love a multi purpose tool and it sure does the trick! I love my OXO peeler. It has a big handle that my hands find much easier to hold. I could really use their ice cream scoop. Mine broke about a year ago and I haven’t replaced it yet. love my OXO vegetable peeler, all others I’ve owned have not held up! I love my flat whisk. Soooo good for sauces! I have been yearning for a food mill for a coupld of years now. I have a salad spinner that I use all the time. But every single one of the items in your post (except the berry strainer, which is a new-to-me product I hadn’t heard of before) has been on my wishlist! They have great kitchen tools! Let’s see..l this weekend I used the box grater three times, the muddled twice and the peeler a few times. Also reached for the flat whisk and used the Mandeline to make a fabulous beet salad. Love OXO! Looks like great products! I just put up 5 lbs.of figs. It’s kind of hot down here to be doing hot water bath canning, but I keep thinking of that tasty end product! Honestly, I wish I had that food mill! That sounds like a dream to have in the kitchen. I wish I had the food mill–especially for processing blackberries to make jam!! Removing the seeds with a sieve (my usual tactic) is one of my biggest cooking pet peeves. I love my OXO small whisk – it makes a breeze of any small whisking job. Love my OXO vegetable peeler! I use the 12″ nylon tongs just about everyday for something. Good tongs are invaluable in the kitchen. I have many, but I have two oxo vegetable peelers – sharp, comfortable, and enough for when I friend (or kid) wants to help! I love their mixing bowls and spatulas! I love love love my locking 12 inch tongs from Oxo. And the salad spinner. I also love their Hand-Held Mandoline as it doesn’t take up much space in my far-far-too-small-apartment-kitchen. That cherry pitter looks wondrously time saving, but my favorite OXO tool is still the swiveled vegetable peeler. My life changed when that little time saver came into it. Potatoes, carrots, turnips… all much easier to serve. Love my oxo tongs and salad spinner . I currently have a freezer full of cherries so a cherry pitter is on my wish list! Though I would kill for any of the kitchen gadgets described above, I must rave about my OXO mango peeler. I first saw it on a show with Bobby Flay. It does such a good job working around that huge pit, and makes my life easier during mango season. I recently moved to Portland, OR and have been taking advantage of all of the nearby farms and have just started canning. I would absolutely love the oxo food mill, as well as everything else on the list. I love the clean design of the oxo product line! My OXO mandoline is one of the best birthday presents I’ve ever received. OXO cherry pitter for sure! I’d love to get a set of Oxo’s stainless mixing bowls! I love all things OXO and my favorite is the Anniversary Tea Kettle, which I have and use every single day! My OXO tongs are my favorite gadget! I haven’t tried their strawberry huller, but I do love my simple OXO vegetable peeler. I’m faster with it than a knife when apple season hits. What a great giveaway! I think my favorite tool I have is probably the can opener, because its the kind that cuts UNDER the lip instead of inside it. OXO makes great stuff! I’d love any of the items you’re giving away – I’m a kitchen gadget addict! Those make my equipment look like the antiques they are! What a cool strawberry huller. Among other things I have an OXO whisk that I love. Unfortunately, my husband loves it too, so it’s often already dirty when I want to use it. Love my cheese grater! I could use ALL these good things! I love my Oxo peelers – I have two regular peelers and a julienne peeler. And my Oxo dry measuring cups and spoons. And my Oxo whisks. And my Oxo angled measuring cups! (Why yes, I am a bit of a junkie). I love my oxo vegetable peeler!! It fits nicely in my hand, doesn’t bite into my fingers & stays sharp even after peeling tons of apples, carrots & potatoes! I tend to buy OXO products because they are well made and work the way they are supposed to. I have OXO peelers (3), tongs (3), a salad spinner, and a kitchen scale. Love them all. I don’t currently own any OXO items, but looking around on their site, I realize what a shame that it. If I could pick one product as my favorite it would be the bottle drying rack. It would be super functional and looks good enough for me to keep it out on the counter! I second “veggie peeler.” Crazy how fast I could suddenly peel apples after I got an OXO. Very comfy, very well-designed. Wow – amazed by the number of comments already! I think the only OXO gadget I have at the moment is a slotted spoon! It’s handy, though. If I could choose some new ones, I’d go for almost anything in the Meat & Seafood section — like the shellfish set, poultry scissors, fat drainer or turkey baster. I have zero tolerance for a bad can opener or vegetable peeler – the difference between a horrible one and an awesome one (OXO for me) is so little and a bad or rusty one can injure you! Therefore, those are my favorite OXO tools… among many! As I read the four products being given away, my reactions were, in order: NEAT! OOOOH! Wow!!! WAAAAAAANT!!!!!! I have the peeler and these tools look wonderful! I love my OXO Dough Blender. It is my go to when making scones, pie crust, and biscuits. I don’t even precube the butter when I use it. It’s the greatest purchase I ever made, and beats busting out a food processor when all I want to do is make some morning biscuits quickly. All of these tools look great! The only OXO product I have is a can opener, it’s definitely the best & most comfortable one I’ve used. I love OXO products. my nested mixing bowls might be my favorite (they get the most use), or maybe my teeny tiny spatula (so twee and good for canning), or my countertop compost bucket that I cart between work and home every Monday to collect old coffee grounds and fruit peelings from my office. that food mill looks great; I have my grandparents’ old food mill which lacks the charm needed to make up for how difficult it is to use. I love my OXO ladle! I use is all the time!! After 28 Summers of eating, I finally bought and experienced my first cherry pitter (from OXO). There may have been a serenade of love and appreciation to the instrument, right there in my kitchen. I have a few OXO tools that I love and use all the time, one of which is a stainless steel strainer. The holes are the perfect size so that nothing falls through and mostly nothing gets stuck, and it never rusts! I really do with I had one of those OXO mandolines, though. I’d get a lot of use out of one of those! I use an OXO handheld can opener everyday. Sure beats any electric! Love their tools. Salt and Pepper Mills, I just love them! My first favorite OXO tool was a pair of tongs but they melted (user error), but the other two favorites are my peeler (makes even peeling large amounts of veggies comfortable) and my salad spinner (useful for much more than just salad). I think my favorite is their tiny spatulas. But I LOVE that food mill. I am always bothering my mom for hers and I think she might be tired of that. The different screens are genius!!! A food mill is definitely the number one Oxo product that I’m wishing for right now… I’d use it not only for berries, but also to make fresh tomato / bell pepper soups or pasta sauces! Oh, hands down………..I love my OXO Salad Spinner! Don’t know what I ever did before I got this item. I love my tongs from Oxo. They are versatile and I love that they are heat resistant. I don’t have any cool kitchen gadgets but I would love to have that OXO Food Mill! I have been wanting a food mill for oh so very long. I love that theirs have different inserts. i do have the peeler which I love. The salad spinner; our’s has lived with us for 15 year, and was bought by my husband as an ill-advised Christmas gift for our daughter, then 12. She had a bunny, and had to wash greens for her daily. I knew she would not be best-pleased, and he presented it as a joke-gift, which made her laugh. All these years later, it’s still making salads, though daughter is a continent away. My husband passed away some years later, and the bunny as well, but they are all with me, just a little, when I spin the greens. I love the Good Grips basting brush. It’s the first silicone one I’ve found that really holds a good amount of sauce for brushing or basting with. I love the silicone spatula! My Oxo veggie peeler is so much better than one I had to use in another house. Are you kidding me! This giveaway is my dream. I’ve just come across a windfall of cherries and have now watched too many episodes of Mad Men, pitting in the dark. My mom has the colander, and we use it at her house all the time (also great for beans and sugar snap peas). My mother and mother in law both have foley food mills, but I have yet to find one at a garage/yard/rummage sale. Yet, I also want to get the oxo micro planer. We’ve gone through 2 kitchen aid ones and Bo have broken at the neck. But the food mill with different screens… That might be my next purchase. You know, if this giveaway doesn’t come through. BTW I’ve been referencing all sorts of your posts the past few days as I work my way through several gallons of cherries. Thanks for the great ideas. I just might pickle some tomorrow if I get adventurous! I have an OXO salad spinner that is awesome sauce! OMG – the cherry pitter! That food mill looks pretty wonderful too! Love my OXO pizza cutter! I have the cherry pitter and was telling my neighbor how much I love it so if I win I will gladly be sharing this one with her. I must have that berry bowl!! There are so many items that I would LOVE to have! The bottle brush, berry strainer, etc!! I adore my OXO food mill. It was my first birthday gift from my boyfriend’s mother and gets tons of use! I have and love their angled measuring cups. I would love to have the foodmill. I love the garlic press, especially since it practically cleans itself. I wish I had the food mill! I have the foodmill and it is EPIC! I use to evenly crush my berries for jam. It removes a nice portion of raspberry seeds so that the jam is not *all* seed! I had no idea there were food mills out there that were easier to clean than a Foley. I could really use one. Also, I love my jar spatula. I love OXO, they consistently have good design at great values! The tool of theirs that I use the most frequently probably has to be the humble vegetable peeler, it’s a little heavy but it has a lovely grip. I love the OXO can opener I have. The turny bit is nice and ergonomic! Oh, a cherry pitter would have come in handy when I did 15 pounds last wk.. And mom would finally quit begging me to give her back her food mill, I loth giving it back because inevitably I need it ( the ancient 1 piece model it is).. While scrolling through the OXO website, I realized that we have a ton of OXO kitchen tools. OXO stores, spins, tosses, and turns (and even weighs) a lot of the food in our house. My favorite, though, is the V-Blade Mandoline. I am able to slice through huge amounts of veggies quickly and uniformly. Watch out thumbs, the mandoline is coming out! My fav Oxo tool would have to be their salad spinner! Definitely their salad spinner! So much better than any others! I just purchased Oxo’s 3-piece stainless steel mixing bowl set and can’t wait to test them out. I have so many Oxo kitchen tools that I LOVE, so it’s hard to pick just 1 favorite. I guess I would say my favorite is the one I use most often – the vegetable peeler. A close 2nd would be the garlic press. I love all my OXO tools – especially my tongs, can opener, lemon zester, and of course – cork screw! I love my veggie peeler, but would love the food mill. I haven’t come across an OXO product that isn’t great. Their veggie peeler is probably my favorite – it stays sharp FOREVER, has that nice little scoop at the end, and just feels good in your hand. I’d love to try out the berry huller; I’m such a sucker for fresh berries. I have an OXO product I adore! It’s the Good Grips Fat Skimmer (2 cup) and now that I have one, I never want to cook in a kitchen without one. If I could change anything about it, I’d presto-chango it into the bigger version. I love OXO tools. I’d love to have their mandolin slicer. I loved our OXO spatula so much that I registered for another one for our wedding. I ended up getting six more!!! They already last forever, so now I have an endless supply. It sounds so simple, but I don’t think I could live without my veggie peeler! It WAS my husband’s when we met, but after 13 years…it’s mine now!! Can’t live without my potato peeler and pizza cutter. 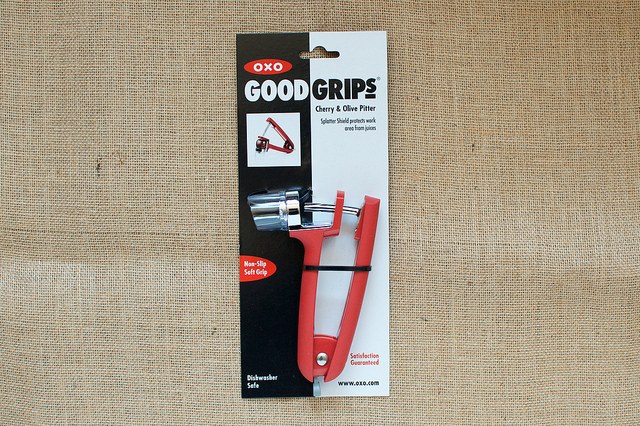 I <3 my OXO Good Grips can opener. It is big fat and easy yo use. I have had it for years and it does not get used much anymore but I can not imagine having any other. I’m a fan of my potato masher. A nice grip, a good weight. That berry pack is everything I need! We just put in 6 strawberry beds and planted a cherry tree last year (yes, I know my expectations are skewed). I need a mill because last year’s black raspberries were just too seedy in their jam (your recipe… delish!). My favourite OXO tool is my garlic press. I use it constantly! I love my OXO salad spinner and cherry pitter! I would give my left arm to have that cherry pitter. I just made cherry jam yesterday, and had to dig the pits out with my fingers! needless to say, it was a small batch of jam. as for the OXO stuff I already have: my tongs, garlic press and meat tenderizer see the most use. Plus I’ve kidnapped my moms food mill, so it would be nice to have one of my own when she realizes hers is missing. I love my OXO salad spinner!! I love my Foley food mill, but if there is a better one, I bet I’d love it even more. Every time I make strawberry jam I say I’m going to buy a strawberry huller and it still hasn’t happened yet. I love my OXO fat separator. It works so well, and all the excess fat from making gravy separates out and can be removed before it ever is presented to guests. The strawberry huller and cherry pitter would help so much in jam season! I have a lot of OXO tools. I love all of them because they are so well designed. My favorite one is the herb spinner. What a fantastic giveaway! I have an OXO mandoline and I love it! my scale. I never, ever thought I would need one but now I realize that weight is more accurate than measuring cups when baking. The scale has made a huge difference in what comes out of my kitchen! I have a bunch of little kitchen stuff from OXO. Off the top of my head I have an apple corer/slicer that is nice when the apple is perfectly shaped, works on onions too. A food mill would be nice for berries, I am not suppost to put berries in my sauce maker. I LOVE my OXO mini wisk. It’s perfect for mixing a small amount of dressing or making the sauce perfect for Mac & Cheese. Plus it’s small so it doesn’t take up a lot of space. I saw their adjustable measuring cup being used on Alton Brown’s show and I’ve been itching for one ever since. Other than that, the food mill would be awesome, or maybe that (totally not necessary) super cute avocado slicer/pitter. I have a bunch of OXO pop containers and they are great for dry goods. I love my smooth edge can opener from them — no more cutting my fingers! It seems ironic that this avid canner’s favorite OXO tool is the can opener! I have the flat whisk and it makes making sauces, roux, and gravy a snap!! Okay, I really love my OXO bottle brush. Is that weird?! I have a bunch of OXO tools, but I think my favorite is my salad spinner! I love love LOVE my collapsible tongs and have lusted after the OXO food mill for several years, basically since I started canning. It’s been at the top of my list!!! I have a pair of OXO locking tongs. I use them for everything and anything, daily. As simple as they are, they are my most favorite. I’ve been eyeing the OXO food mill for a while and would love to have it when I can tomatoes at the end of the summer! Though it is a very simple tool, I definitely love my locking OXO can opener the most. I don’t have many OXO tools, but I’d say their salad spinner looks pretty nice! I don’t know what I ever did without one! The only OXO tool I have is a peeler, and it works great! I’d love to win these tools to use in my kitchen. I think the first OXO tool I ever saw is still my fave, the potato peeler with the big easy to grip handle! OOOOOhhhhh, I’d love to have the strawberry huller. tHAT FOOD MILL LOOKS REAAAAL USEFUL! It is hard to pick just one OXO favorite in my kitchen! I love my OXO Garlic Press when I make something that calls for a ton of fresh garlic, it makes the job quick and easy! But I could not live without all my OXO canisters in my pantry, awesone POP containers are air tight and keep the contents fresh! This year my daughter brought 2 of the lock top storage containers. She said they belong to a friend. I still have them 🙂 and it’s been a month. Shhhhh you didn’t hear it from me. Going cherry picking this weekend. Our season is short. Seriously thinking of borrowing one from a friend. My favorite tool is usually my most recent acquisition. Right now it is my OXO batter bowl. It has markings for up to 8 cups. Often while canning, the number of jars needed is a guesstimate. Now I dump my ingredients into the bowl and measure. I’d love to try the huller…never had one! I sent my husband out on Thanksgiving for a potato peeler and he came back from the market with an Oxo peeler. Since then one of my favorite tools, making peeling so much easier than before. Hello… I really would like to try out the foley mill. Very cool and mine is sooo old. I also would love the 22 pound digital scale. It would be oh so handy for canning. This is an amazing giveaway! I would love to have that food mill, as well as their nine-piece nesting bowls and colanders. I have been dreaming of the 5-pound scale for a while…still on my wish list! I love my OXO salad spinner! There is nothing worse than a soggy salad! I would love that food mill! I have the cherry pitter and I really like that. My favorite Oxo tool is the cherry pitter. Last year I made a batch of slightly spicy cherry barbeque sauce after my husband came home with the pitter for me. It made the job so much easier! I’ve always been a fan of their swivel vegetable peelers. My favorite OXO tool is a small whisk that my late grandmother-in-law gave me at my bridal shower – it’s wonderful in a small container and looks as good as the day I got it. I love the OXO garlic press. Almost everything I cook contains garlic so this tool is a dream for me! My favorite OXO tool is their vegetable peeler, but that food mill looks incredible!! OXO… love the strawberry huller, because i love strawberries! Apple divider! – lovely invention. Would love to have the cherry pitter! My favorite oxo tool is my pastry blender. Makes quick work for pie crusts and such. LOVE the OXO digital scale – I use it all the time! My OXO veggie peeler is the best! But that food mill sounds fab! Dont have anyOXO… but would love the food mill! I have a huge patch of wild raspberries nd that sure would come in handy! So far I’ve picked 4 gallon ziplock bags of berries! I have a couple small basic items but that food mill!!! Oh my!!!! I like the adjustable measuring cup….so handy! I love my OXO mandolin. I do love all my OXO tools!! I love my nylon pancake flipper. It is super thin and flips things easily. I love my OXO microplane zester. (I also have a dough blender from them that I adore, but the zester’s the item that’s in heaviest rotation. It’s pretty much constantly either in use or in the dishwasher). So many OXO tools live in my kitchen. The microplane, the 9 inch tongs, the vegetable peeler, the poultry shears. So hard to chose. So, I won’t. I have arthritis. OXO tools are a godsend to me. I love my Oxo peeler! And could really use a cherry pitter! I love the POP containers, especially the square ones. I need more! I have the food mill and LOVE it! I’ve used other food mills before, and they slip around and the food just spins on the grate- finding this one was a godsend. Now I need the other pieces in this set! my favorite oxo product is the canisters. My entire pantry is filled with them! I like my oxo angled measuring cup for liquids. I’ve really been dreaming of getting a food mill! That food mill sounds great! I have the garlic crusher which gets a LOT of use in my kitchen. Our cat’s steal bread, the biggest POP square container keeps it safe for us. Great post! Always love to hear about tools to make putting up food easier. Getting 4lbs of cherries from my CSA fruit share tomorrow and a cherry pitter would be handy. I use my OXO tongs just about every time I step into the kitchen and the microplane certainly comes in handy for everything from lemon zest to freshly grated cheese over pasta. Favorite tool: OXO salad spinner! It’s used at least once a day. Today it had fresh picked peas, strawberry spinach and some mixed greens get washed in it. I also like the fact that I can take just the plastic insert out to the garden, pick into it and then bring it in to wash and spin. I love the OXO serrated peeler for peeling peaches and tomatoes. My favorite OXO product is my mandolin. I love the cherry pitter but really need the food mill! I love the cookie scoop! I love canning and cooking and have done both for 20 years and recently I realized I have never owned a mandolin. I would love to get one from OXO, I think I may have to order one. It’s a tossup between the vegetable peeler and the can opener. The only OXO products I own are a set of mixing bowls we received as a wedding gift. But I love them! They are stainless on the inside, white on the outside with grippers on the bases so they don’t slide around while I’m mixing pancake batter or whatnot. These products look amazing, they would be an awesome addition to my kitchen. The multi Purpose chopper scraper. I use it every day…more than once for everything! My favorite is probably the zester — not sure how I’d live without it! the OXO citrus juicer is pretty swell. I like the ceramic head on it. Oh, the thought of a food mill that doesn’t fight back! I LOVE my OXO can opener…best ever! I love my veggie peeler, make that “peelers” plural. They have a place in a drawer but rarely see it I use them so much! I love my Oxo peeler, works so easily. I’d love to win the great giveaway! I love my microplane, and would love that food mill! Their vegetable peeler is the most comfortable ever. I keep thinking I should buy a couple more in case they don’t make them when I need to replace mine. I love the potato peeler (ok I guess it is a vegetable peeler)! It makes the job so easy. I also use it when making carrot or cucumber peels for a salad. Comfortable and sturdy! Their cheese slicer! We eat alot of cheese n crackers! I wish I had a cherry pitter. I remember last year I spent a good hour slicing cherries in half, getting the pits out, then spent the rest of the day with red fingers. No fun! Their mandolin. I love Oxo products! I love their cheese grater–there’s one with two sides that’s foldable and detachable and double-sharp so it grates when you run the cheese in either direction. I love my Oxo Good Grips vegetable peeler !! My favorite item would be the Food Mill…..sooooo many uses…jams, applebutter, ketchup, pasta sauce…..too many to list! Best can opener ever! Vegetable peeler too! I like my Oxo tongs. Love their can opener – great products. Would love to try out these new ones. Gotta love the food mill! I have a really great can opener that they make, as well as some other good equipment – but none of these canning supplies! I’m currently loving the Perfect Pull Baby Wipes Dispenser! I *love* my 3 inch mini-strainer! Love the give away! I love the meat tenderizer. I’m constantly using it for all kinds of applications besides just pounding or tenderizing meat. I love their salad spinner!! I would definitely pick the food mill – I hope I win one! I’ve got the Oxo 11 lb scale with light up pull out display. Very handy, sees a lot of use. oh gosh…i have a LOT of OXO stuff in my kitchen. i have their knife set, which i use multiple times a day and love. i also like their veggie peeler! I have an OXO veggie peeler that I’ve used for at least ten years-I’ll never go back to the old style metal peeler. Also, use the salad strainer and recently got the fat separator, which work s great to make homemade broths and stock. I’d love to have the food mill! 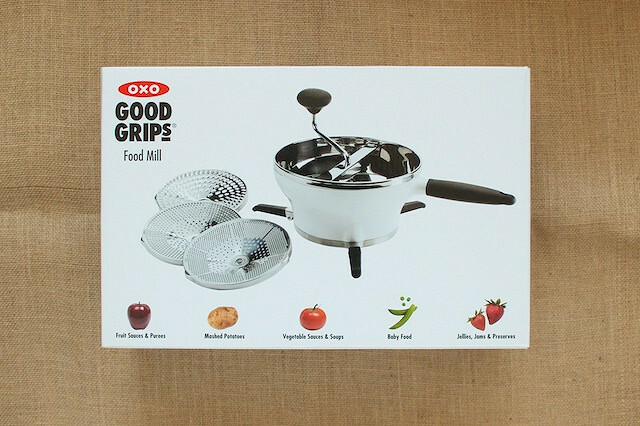 I’ve been looking for a good one for a while now for all my berry and tomato projects and the OXO one looks great! I love my vegetable peeler because the handle is sturdy and the peeler does not flop around. I’ve had the veggie peeler for at least ten years, and will never go back to the old style metal peeler; also have the salad strainer and recently purchased the fat separator, which is great for making homemade broths and stock. I have none of their products, but I want a better fruit peeler. Mine is a danger to society and more importantly, me. My tongs from OXO are fantastic! I love my OXO whisk so much… I bought a second one just for when the first is dirty. *blush* I also loooooooove my OXO pizza cutter. doesn’t cut my hand or anything in my drawer, just pizza, correctly, EVERY TIME. I could talk about the mandolin or the salad spinner or the pop containers.. yeah, I’m a wee bit obsessed. 🙂 Love this giveaway!! I have their veggie peelers, both the ‘straight’ and Y… use them quite a bit. I like the Oxo peeler. Its a lot more secure feeling than the skinny all metal models, so I don’t have worry nearly as much about slipping and gouging myself. I absolutely wish I had an Oxo foodmill! My other Oxo products work like a dream! I really want an OXO food scale. It would help me a lot with baking fresh bread! We love our Oxo salad spinner & vegetable spinner. They are efficient & durable, & I’d love to try more of their products, especially these canning & preserving tools. Also love Oxo cubes (all kinds), but that’s another story. I have the OXO potato/cucumber/zucchini/everything peeler. I’ve had it for years. Literally a lot of years and it is still in great shape and is used A LOT!! I love my oxo salad spinner and peeler the most of all. The berry set looks so cool! Started using the cupcake corer…super cool. Oxo in general has some of the best quality and easiest to use small kitchen tools. I love their can opener and grater in particular. Nearly all my daily use kitchen tools are OXO – but I do particularly love my salad spinner. Awesome give-away! I have a bunch of items including micrograter and whisks but I love my pastry brush. It doesn’t melt for one. And it feels good in my hand. Did you know the inventor of this company just dies last week? He invented this company because his wife had arthritic hands. I have several nice OXO tools. But the ones I wish were in my kitchen are 1. the food mill you show, and 2. one of their mandolins. So basic, and so essential… my trusty OXO vegetable peeler! use it every day. I have a number of their things but my favorites are the 1.5 tbsp scoop and can opener. Besides being good working tools OXO are kind to my arthritic hands. I love my mini salad spinner, helps me keep my leafy veggies clean and dry. Helps them last longer in the frig! I love their vegetable peeler. I love my OXO peeler. I’ve tried many and this one is the most comfortable to use.Love the way they designed the handle. I have a peeler and tongs that I really love. I would like to get one of their salad spinners. I would also love to win this giveaway. i too have their peeler and also the apple divider and both are great tools in the kitchen. I love my leave in thermometer. Makes it so much easier to check the temp without even having to open the oven door. No loss of heat or chance of burning oneself. Garlic press. I actually bent or broke 1 or 2 or 6 before I spent the money on an Oxo one. So far, it’s still going strong! My family and I eat a lot of apples. We use our OXO apple divider daily! The garlic press!… I have written off strawberry hullers as well. Your post encouraged me to give them another try! So thanks in advance. I love my leave Oxo leave in meat thermometer. The reader stays outside the oven so no more opening and closing the door to check the temperature of the roast. Best invention ever. I have the oxo peeler. I love all the Oxo tools I have already but don’t have any of these — would love to win the giveaway. Thanks for the opportunity! I splurged big time for that same food mill–but mine didn’t come with the other screens (weird!). Totally changed my life in the applesauce/apple butter department! Ha ha! That cherry pitter is going on my wishlist though–I spent sooooo much more time hand-cutting pits out of cherries this weekend than I did actually making my jam! I love my OXO peeler. This is a nice collection of handy tools! A strawberry huller that worked would be wonderful ! 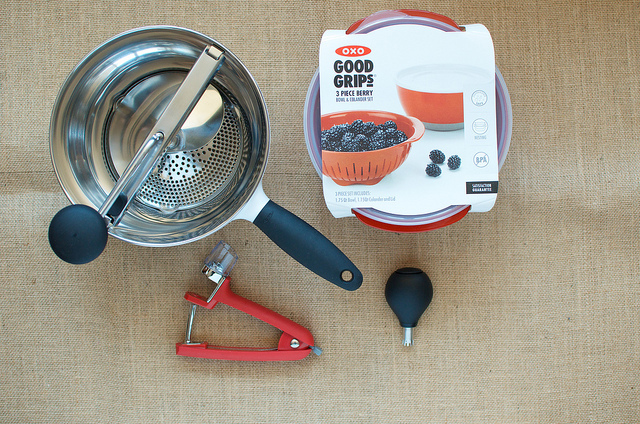 As one jam maker to another — the right tools make all the difference. I love my OXO Salad Spinner! It’s almost always in use! Goodness, I can hardly name just one! If I must, I would have to say my OXO mini whisk since I use it every day to foam my milk for my coffee. But my salad spinner gets frequent work outs as well . . . I am coveting the food mill, however. The Norpro I bought fell apart the third time I used it and didn’t come with interchangeable screens. Love this giveaway! I would love to have the Food Mill! Where I live we have a lot of persimmons and this would make my life much easier when it is time to freeze the persimmon pulp! My favorite is my plain old potato peeler. The handle is very comfortable to hold for long periods while peeling lots of vegetables, not just potatoes. In my opinion, a good tool that is comfortable to hold is priceless. Their new locktop lunch set look fantastic. I love that they say they nest for storage and the tops lock so you don’t leak while traveling to work. I want those!!! The veggie peeler gets used the most. I love my oxo zester. We only have the fruit muddler. Looking at the site I enjoyed the “good cookie” spatula. The food mill would be awesome this year as we want to try to make our own sauce. Thank you for the opportunity. I would love the strawberry huller. I always wanted one but wasn’t sure if it was worth it. Glad to see it is! I too have sworn off strawberry hullers. Your post is making me rethink them. I’m hoping to get some cherries this year so the cherry pitter will come in handy. I own and love the OXO cherry pitter which doubles as an olive pitter in my home! I own the OXO cherry pitter, what a breeze to use! I want that huller! I have an OXO salad spinner that I really like. What a great giveaway!! It would have to be my OXO salad spinner which I bought after my grandson asked me why my salads were so wet! I have the OXO zester and I use it for spices and citrus! I’m also a fan of the stainless steel mixing bowls! That food mill is exactly what I am missing! I’m not new to canning but new to canning tomatoes. Hope I have good luck! I love the OXO tongs with the silicone ends. I use those just about every day. I would love the cherry pitter so I could make some cherry jam! I know, everyone has one, except me. I would love a strainer! 🙂 Thanks for the giveaway! I could not live without my oxo cherry pitter. I love my OXO citrus juicer. I love, love, love their salad spinner. When my son broke mine this past year, I went out and bought the exact same one because it works so well. I’d like a mandoline. I’ve always wanted one, but can never see spending the money. I have a few OXO salad spinners because we eat alot of greens around here and, much like your colander experience, every time I needed one, it was in use. I also have their ice cream scoop. Best scoop ever and we’ve had it a few years now! I don’t own a lot of oxo gadgets, but I have a few. I love to go to the store and daydream browsing all of their fun gadgets. The # 1 on my list to get is that food mill! Love it! I have a great vegetable peeler. OXO always has the nifty rubberized handles that make use a dream! I have a few pairs of OXO tongs and use them constantly. i have the cherry pitter too, and love the anti-splatter shield. I also really like OXO sealing BPA free containers and their veggie peeler. I LOVE the grip on the peeler. They make great stuff and i would love the food mill to make applesauce! I love all of my OXO products but had no idea they made a food mill. I would love one as I have all of the same issues you mentioned with mine. These products are amazing and last forever. I finally ditched my old, dull vegetable peeler a few months ago and got the OXO 3-piece peeler set. I love each of them, but especially the julienne peeler! The cheese slicer and the measuring cups are the most used OXO products in my kitchen. The Can Opener!!! It’s the best. I even give these to friends; it’s just that good. I love oxo tools & have been replacing with them as I can. My favorite thing are their spatulas. I love to use my OXO tongs! Thanks for the giveaway. I have an OXO cheese slicer with replaceable wires. It is the best! I love the fruit miler, my mom had one when I was growing up , she makes this grilled peppers sauce with it yum. I would love the OXO food mill. I have the oxo grater (fine hand held version) which I use daily for zesting, grating garlic or parmesan cheese. It is one of those tools in the kitchen I would not want to be without. Love your blog, have your book, thanks for inspiring me to try new things. I’ve never been on the OXO site before, wow I didn’t realize I was settling for my regular older make do tools. They have so many things I need. 🙂 However as I read the blog today I came to realize that I basically avoid cherries because of pitting them and all the work that would take and is it worth it? Well, I hope to try it out and put away cherries for my family. I’ve just always said “no” in my head. Hope I win!! I have had an OXO apple slicer for years and love it. I use it for apples eaten out of hand and for apples being made into apple pie. I use my OXO wooden spoons all the time and I love them! I wish I had that food mill. I’ve been thinking for a while how much I want/need one. A foodmill would be awesome. I also love their can opener! I couldn’t really choose between my OXO can opener or my OXO potato masher! Love their ice cream scoop. Soft handle means no sore hand after scooping dozens of bowls of homemade ice creams for friends at a party. I love my non-stick whisk… it’s the best one I’ve found in my search for nonstick whisks. Love their scoops!!! Love Love Love….. I use them for cookies, ice cream and so many other things. My OXO salad spinner keeps me eating healthily all summer long. I’ve been looking for a quality food mill. There seems to be so many options out there, its a bit overwhelming. I’m so glad to hear you like using the Oxo brand and I am excited for the chance to add one to my canning arsenal. Also, that strainer/bowl combo is a dream! Where have you been all my life? I actually love their vegetable peeler. It’s comfortable to use, and I’ve had it for years and it’s still sharp. I’ve never had a cherry pitter and I’ve never heard of oxo. I’d love to change this. The food mill!! I borrowed it from a friend last year to make ketchup and it was indispensable! I would love to have one of my own and use it for tons of other recipes. I honestly don’t know how I ever lived without my Oxo salad spinner! Or can opener. Or garlic press. Or … oh heck, they just make great tools. Really want that food mill now! I would love to win the food mill!! I do not own one and this would be much used!! I have lots of OXO tools in my kitchen but I would love a berry mill. OXO makes prep work fun and quick. My current favorite is either the salad spinner or the potato peeler (which I gave to everyone in my family the first year they came out I think). What an awesome giveaway! I looked at the OXO website and was immediately drawn to the Julienne Peeler. It looks like it would save me tons of time since I’m not the world’s fastest knife user. Maybe I should go hunt one of these up! The cherry pitter is my favorite! I never knew pitting cherries could be so easy! lol I even use it for my olives! WOW! I can’t decide between my OXO jar opener or can opener. Both are necessities in my world as I have bilateral carpel tunnel. I’ve been using their products for over 20 years & I’ve never had a bad experience with them EVER! This is a an awesome giveaway. thank you for your posts, I enjoy them as well. I love their can opener that unfolds the top from the can. I love the cherry pitter! My favorite! OXO is such a great company with such well designed products. It is a delight to use any of their products. Kudos for a great article. I would love love love to have a food mill! I had one when my two older kids were babies but it got worn out making home made baby food and I’ve yet to replace it. I just found a delicious recipe for Passata in Food and Wine magazine that I am dying to try this year. It would be the perfect thing to make with all the tomatoes we grow in our community garden plot! The berry pack is awesome! I would love to try all of these. I have a few of OXO tools that I use all the time. I have loved OXO’s Smooth Edge Can Opener in the past. The berry pack looks very useable too. I’ve just begun using food mills with canning this summer and this pack looks great. I love the oxo y-shaped vegetable peeler. It’s perfect for butternut squash! I’ve been wanting an oxo zester after using a friend’s! I love OXOs rubber bottomed metal mixing bowls – so sleek and practical! My husband loves to make pickled sweet cherries and could benefit from the cherry pitter. PS – He loves your blog and we have enjoyed your book. Made lots of strawberry jam a month ago (and your strawberry syrup, yum!). My favorite OXO tool that I actually own is the apple corer/slicer. Makes it much faster and easier to serve apple slices to children, when I need to prepare more than one or two. Wow! A food mill with three different discs. Would be quite an improvement to my antique food mill. I want that green salad spinner! I LOVE my OXO peeler and paring knife. They have been with me through a ton of processing jobs and are still going strong! Can opener is a classic! I love my food mill & use it year round , I wish I had the berry piter at this time of year!! I want the nifty little scale they have! i thought the pull out display was so smart for when u need to use a giant bowl. I’d love the cherry pitter too! I use the can opener & peeler all the time. I love kitchen gadgets, this company is made for me! I’ve had their peeler for years – works great! Strange as it seems, while I love all of the OXO products, my mom has a cake tester (yes, I know, who needs a fancy handle on a cake tester?) that is just too cute. My Oxo peeler is the best one I’ve ever had. I have several of their products, but it’s far and away my favorite, by virtue of it being so much better than any other peeler, ever. I have the same old food mill! I did not even know that they made ones with removable screens. I am in love with the thought of that! I think this OXO food mill would become my favorite OXO product. My food mill is ancient and this one looks like it would be a good replacement. I love my strawberry huller and my food mill. The colander and bowl look excellent; I’m going to be on the lookout for those in my local stores! As for the cherry pitter, it must be better than the one I currently own. Mine works, but it’s not consistent. Count me in for the berry pack! My favorite OXO product is the simple vegetable peeler. I have used many different ones over the years but this one is the easiest, most comfortable. My favorite Oxo tool is their angled measuring jigger. We use it almost daily! For both making cocktails and cooking. We own a couple of them. I love my OXO lemon juicer! No more accidental pits in my food (usually they end up in my husband’s dinner!) After removing the seeds from blackberry jam with a wooden spoon and a colander, I really need that food mill! I’d really like to have one of those cherry pitters, would save so much time with our cherry tree harvest! It’s hard to narrow it down because all of their tools are great! I love my OXO silicone flexible pancake turner which we use for way more than pancakes around here, having a giant spatula is a dream come true. I also like that the mixing bowls stay put when you use them and don’t move around on their own. Thanks for hosting this, your website is wonderful and very informative. I am just getting into canning and would love to add the food mill and cherry pitter to my collection of tools. I have a wisk of theirs, but I would love a food mill like that one! I also have some older food mills that don’t come apart, and are very hard to clean. I have lots of OXO products in my kitchen and I love them all very much! Some of my favorites are my OXO POP storage containers, I can put anything in them from Sugar and Flour to keep them fresh, to the kids snacks on the counter for easy access. I just found your blog and I’m excited to read through some of your posts, I am new to canning, and I can’t wait to try some of your recipes! I have seriously fallen in love with putting all foods in jars! I really like the simplicity if their garlic peeler. I am a rub the garlic between your hands kind of girl. But not only do I end up smelling like garlic, I often cut my hands on the hard nubs as well. Some companies get over complicated with peeling garlic, I like that OXO’s is just essentially a flexible tube that acts like your own hands, but without the smell and pain. I just invested in the cherry pitter and was equally impressed. I love the handles of their more standard products as well like the pizza cutter and y-peeler. I try to stick to oxo because of this fact as I know their items last long and feel good in my hands. I love OXO stuff! We’ve been stocking our kitchen with it for years. For me it’s a tie for favorite between my smooth edge can opener (the first can opener ever not to wreck my wrists each time I use it) and my expandable cutting board with rubber grips that sits over the sink to make extra counter space. I just bought the cherry pitter and I didn’t even use it for canning yet. Pitting cherries for eating makes me very happy. I pitted about 2 lbs. and kept them in the fridge for a easy to pop and healthy snack. I never would have snacked on them it if involved spitting out cherry pits. I’ve used the cherry/ olive pitter before. It’s amazing! I love my OXO veggie peeler and it gets a lot of use! I love oxo and have many of their products but none of these in the giveaway. The three I use everyday are their small knife, peeler, and cutting board. I too must be like your mom. I only have one colander to help in the battle of clutter and I have come to realize that I need more than one. My favorite OXO tool is their 2 cup plastic liquid measuring cup that you can read from the top instead of just the side. I love it and it was worth every penny I spent on it. It is easy for the kids to read and I can pour my liquids in and get a very accurate read. I’d LOVE a new food mill! I have an ancient one handed down from my Mom-in-law. It works, but no interchangeable discs. I have a bunch of OXO tools, my favorite one would have to be the garlic press. It’s heavy duty and cleans up quickly. I would be hard pressed to name my FAVORITE Oxo product. I really have to give the Salad Spinner a lot of credit. I had a cheap one for a long time, and when that finally broke after having seen reviews of the Oxo salad spinner I decided to purchase that. It cuts down the prep on garden fresh salad by half and I have no problem storing it in the fridge as that spinner really gets the water off the salad. I’ve had great salad that I had prepped 5 days prior now. Best $ ever spent in my home. I love the OXO pastry cutter. I use it for making biscuits, smashing potatoes and breaking up fruit in the jam pot. Hands down our OXO Digital food scale! It helps with measurements for canning/preserving and my husband uses it regularly in his brewing — love it! I love the cherry pitter! I love their veggie peeler! I’ve had mine for 10 years and still works just as well as the day I bought it. I don’t have any OXO but would love one. This one, The Berry Pack, that you are giving away would be great. We went blueberry picking a little bit ago and would have loved to have this,we are planning on going again in the future. This would be great to have :-). I also have grapes in the backyard which I have been have a bugger of a time figuring out what to do with them. I am trying to save up to get my canning supplies so this would be awesome to start out with. I have the cherry pitter, and it’s great, but I use the vegetable peeler much more often. It’s fifteen years old and I’m just now wondering if it’s a model for which the blades can be replaced – not sure if it needs it, but you often don’t until you try a new blade and feel the difference. I love all of my OXO products! But, I have to say the citrus juicer is my favorite. I am new to canning, and I see an OXO food mill purchase in my very near future. Well, since today’s my birthday, and I really could use a food mill, to help me extend my work as an LA County Master Food Preserver volunteer. I am hoping my birthday karma will result in a win!!! I use almost exclusively OXO products in my kitchen. Thanks! It is a tie between my Oxo Food Mill and my Oxo Julienne peeler. Besides for my many colanders I also like to have a good assortment of cutting boards on hand. Even if I don’t win this drawing I can tell already that many of the above will be in my kitchen before too long! I love my OXO salad spinner. Also their teeny tiny measuring cup — genius! I love the cherry pitter! I bought one a couple years back and was thrilled with how easy it made pitting. I am a big fan of the tongs that stay closed when you want them closed but then easily open up when you need to fetch things of any size with them. They clean well, they work on any size anything (not just food) and they rock, OXO did a great job remaking a common item that frustrated me in the past but their version just works like a dream. The food mill is something I would really like to have. I’m tired of mooshing things through a sieve with a rubber spatula!